A large percentage of the materials that we study are made in our own laboratories here at Warwick. We prepare both polycrystalline and single crystal materials of a variety of classes of materials including intermetallic and oxides systems. For more details see the Single Crystal Growth page in the Research section of this web site. We have several types of system available for the preparation of samples including three infra red (IR) image furnaces, a three zone furnace, three argon arc furnaces, an r.f. generator with cold boat, and a range of standard furnaces, some with controlled atmospheres. We currently have three operational image furnaces that are used to grow single crystals of a wide range of materials. Different growth techniques have been employed including the floating zone and travelling solvent floating zone methods. An IR image furnace has a number of significant advantages over the more conventional types of apparatus that are used to prepare single crystals. Some of these are outlined below right. The first IR furnace was installed at Warwick in 1991. It was a two mirror system, (model SC-N35HD), manufactured by NEC in Japan. This unit was retired in 2013. A schematic of a typical two mirror IR furnace is shown below. Light from the two halogen bulbs is focussed by the semi-ellipsoidal mirrors onto a central zone. In this case the mirrors are gold coated water cooled aluminium blocks. 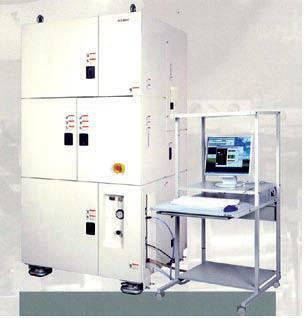 Temperatures of up to 2150 degrees centigrade can be achieved in this system. The two counter rotating shafts are used to support the polycrystalline feed rod (upper shaft) and the single crystal/seed rod (lower shaft). A molten zone is established between these two solid rods. Uniform illumination and temperature profile. Non metallic materials can be grown. Floating Zone and Travelling Solvent Floating Zone methods can be used. Uniform well defined doping levels. Schematic of a 2 mirror IR image furnace. The liquid forming the molten zone is held in place by surface tension. The rotation of the shafts helps to stabilise and trap the melt, mix the constituents to homogenize the sample and also produces a more uniform heating of the molten material. The feed and seed rods are slowly moved downwards (growth rates vary between 0.25 and 10 mm/hour). New material is introduced into the molten zone from the feed rod and deposited in the form of a single crystal onto the seed rod. The growths take place inside a quartz tube. This can be over pressured with up to 3 atmospheres of a gas that can be selected to suite the materials being prepared. Choices include a reducing atmosphere such as an argon/hydrogen mixture, an inert gas such as argon or nitrogen, or an oxidising atmosphere of air or oxygen. Sample boules of up to 80 mm in length and 8 mm in diameter can be grown. Single crystals are extracted and prepared for further studies using a range of crystal cutting and polishing tools. One of three IR image furnaces currently installed at Warwick, this is a four mirror system (F-ZT-10000-H-IV-VPS) manufactured by Crystal Systems Inc . (CSI) of Japan. This machine was purchased in 1999. It has several advantages over older 2 mirror systems. As a result of the four mirror geometry, the heat is introduced into the sample in a more uniform manner and the spatial definition of the hot zone is improved. Note, our use of lamps with flatter filaments has significantly improved the definition of the hot zone in our two mirror system. This CSI machine has a sample chamber that can be pumped out down to 10-6 mbar using a turbo pump, and then flushed with an inert gas. As a result, materials that are oxygen sensitive can be prepared in this system. The growth chamber can also be over pressured to 9 atmospheres above ambient pressure. This means that we can attempt to prepare materials with higher vapour pressures. The CSI IR image furnace in action. Two of the four air cooled mirrors can be seen. A camera mounted just below the centre of the mirrors is used to monitor the sample during growth. The sample shafts (top and bottom) are mounted inside stainless steel bellows. The top set of bellows is visible in this picture. We have a second four mirror system (FZ-T-12000-X-VI-VP) also made by Crystal Systems Inc . Japan. This machine was installed in our laboratories in September 2001. It is a Xenon lamp system with enough power to melt materials up to a maximum temperature of 2800 ˚C. The uniformity of the radial illumination and the very well defined vertical power profile of this furnace allow us to perform exacting "travelling floating zone" growths using a flux. The sample chamber can be filled with a range of gases (O2, Ar,CO and various specific gas mixtures) up to a pressure of 10 atmospheres. This provides reliable, stable crystal growth conditions and can prevent decomposition or the formation of additional phases. The system can also be evacuated down to 10-6 mbar, for efficient flushing and for work under vacuum. This Xenon furnace allows us to produce larger crystals of many of the materials that we produce in the halogen lamp furnaces described above. Geetha preparing the four mirror IR image furnace for a growth run. This furnace has also enabled us to extend our research programme towards the structural, magnetic and superconducting properties of a large number of refractory oxides, borides, carbides, silicides materials that can only be produced in the temperature range we can reach with a Xenon lamp furnace. E.g. La doped divalent alkaline-earth hexaboride CaB6and rare earth hexaborides EuB6, (itinerant versus localised ferromagnetism), borides such as REB50 materials containing the B12 icosahedra (low-dimensional magnetism) and a number of materials with specific applications, for example, SiC (high temperature electronics application) and YB66 (soft x-ray monochromator for synchrotron radiation). The newest of our three image furnaces is a 2 mirror system made by Canon Machinery , Japan and was installed in 2007. The SC1-system has a standard double elliptical mirror geometry and the two 1.5 kW lamps providing a maximum operating temperature of 2000 degrees centigrade. Growth speeds of between 0.5 and 50 mm/h in a flowing gas atmosphere at up to 3 bars of pressure are possible. The use of a PC makes it possible to perform active (remote) control of the drive motors and lamps and to collect a record of the growth for later analysis. The Canon Machinery SC1-MDH 11020 showing the furnace and the PC control unit. A radio frequency (rf) generator and cold boat system are used to zone refine and prepare polycrystalline samples of metallic materials. The rf generator is 30kW Stanelco set . The copper water cooled cold boat is mounted inside a quartz tube. This tube can be pumped down to 10-6 mbar using a diffusion pump and flushed with inert argon gas. Polycrystalline samples of intermetallic alloys and compounds can prepared using our tri arc argon arc furnace (User Manual available here). In this system oxygen sensitive materials are melted under an inert argon atmosphere. Samples are heated by an arc from a set of three thoriated tungsten electrodes. The system uses a conventional welding power supply generating currents of up to 50 amperes. The molten samples are supported on a water cooled copper hearth. Materials can be cold cast into stick moulds or used to prepare single crystal samples by conventional flux methods. A conventionally heated three zone furnace is used to prepare single crystal materials via the vapour transport method. A conventionally heated three zone furnace is used to prepare single crystal materials via the vapour transport method. A number of conventional furnaces are used for preparing polycrystalline materials and annealing. We also have x-ray and SEM/EDAX facilities available in the Physics Department. Preparation of a pellet of Ni-B flux in the rf-cold boat system. The sample can be seen glowing inside the copper work coil. In the table below you can find lists of chemicals available in the Superconductivity and Magnetism Group Laboratories for sample preparation. Please consult with your project Supervisor and a staff member of the Superconductivity and Magnetism Group before using any of the chemicals in your work. The quality of the single crystals we grow are checked, and samples are aligned for experiments, using a real time Laue X-ray imaging system. The Photonic-Science dual camera system allows a digital back-scattered Laue diffraction pattern to be recorded, with a resolution of 2080 x 1392 pixels and 12-bit digitisation at 10 MHz. The X-ray beam passes through the camera in a straight lead lined tube. The image areas allow some overlap to permit image stitching and provide a single continuous image with an input dimension of 156 mm x 104.4 mm. The x-ray scintillator screen is made of GdOS:Tb 0.1 mm thick with a peak emission at 550 nm to match peak QE response of the CCD and is covered by a thin aluminium light exclusion window. Samples can be translated in the beam using a system of motorised stages provided the Newport Corporation . The whole system can be controlled remotely via a PC.